Susan – What are you up to? 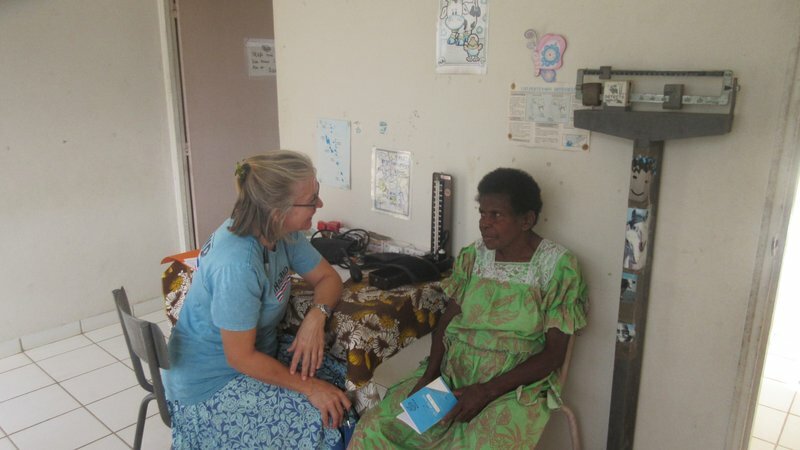 Susan is a health volunteer serving at Lamap Health center on South Malekula. Susan has been at the health center for almost one and half years. She has been doing an amazing job supporting the staff at the clinic and around her community. She takes her work seriously and is always looking for opportunities where she can be helpful. With only two registered nurses, Susan’s day is never dull. Her day begins with prayer and a hot cup of coffee. She would leave her house and walk over to the Health Centre. The Health Centre opens at 8 a.m. and Susan faithfully keeps up with the work schedule. She helps out with doing small awareness's in the hospital. For example, when it's NCD (Noncommunicable diseases) day, patients who come in for the checkup or doctor’s appointment see Susan first; she checks their weight, talks to them and records information in the patient's chart before the patient goes to see the nurse. Susan’s background is a nurse and although she is not allowed to practice as according to Peace Corps rules, she tries her best to build the capacity of her colleagues and at the same time helps with all the sick people that come to the clinic. Because Lamap has 15 villages, three days a week she accompanies her counterpart while she gives health toktoks (awarenesses) to the people at the surrounding villages of Lamap health center. Ellian, Susan’s counterpart, is very happy and feels satisfied with the work Susan is doing. Together they conducted awarenesses and gave information about yaws, malaria and what makes a healthy village. They collected information through the record they received from patients and from the health survey they conducted from the surrounding villages and presented the results to the community. She actively participates in all the work that her counterpart asks her to help with. Lamap Health Centre often receives assistance from New Zealand Volunteers who do various work around the hospital like renovating or providing clinical assistance, and Susan would patiently work and collaborate with the team to complete the assigned task. 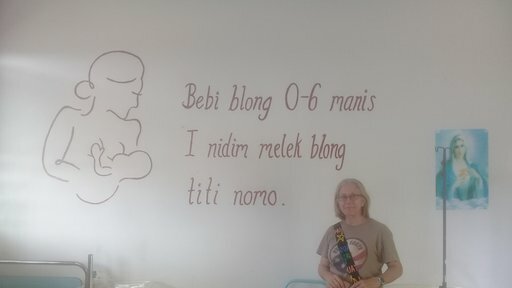 One example painting a mural at the maternity ward and other projects around the health center. One of the health talks Susan did was at the Catholic Mission School near her health center. Susan first spoke with her counterpart about doing a talk on menstruation. Then they both went and spoke with 45 girls ages 11 to 15 about body changes and sick moon/ menstruation. They both gave each girl a package that contained two reusable pad holders with several cloth liners. They stressed the importance of caring for their bodies during their periods etc. They also gave a talk about family planning but stressed the importance of school and& education, demonstrated condom use and importance of self-respect. They discussed sexually transmitted infections. Talks lasted for about an hour including question time at the end. 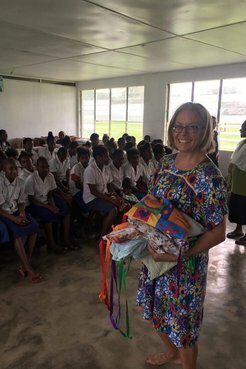 After the girls' talk, about 35 boys of the same age came into the classroom and Susan also spoke about body changes for boys, family planning, sexually transmitted infection. They talked about condom use and demonstrated condom use. There was also discussion around domestic violence. Slightly less time than the girls' talk but they also allowed time for questions at the end. Apart from all the seriousness of work, Susan loves to take long walks, visit a couple near the wharf, grab a good book, go to church to pray, eat lunch with her host family on Sunday, sit outside her veranda with a good book with her cat and enjoy reading. At the same time she loves looking across the beautiful blue water of Lamap harbor. What a great place to be. Thank you, Susan.